Dive deep into dream interpretation. Everything you need to know is here. Dream School is ready to accept students! Dream School is an online school for learning dream interpretation. It offers a free sampling of dream interpretation lessons and a base course: Dream Interpretation, the Art and Science. The lessons are thorough, explained with example dreams I’ve interpreted, and recorded in HD video. More content is coming just as soon as I can review and upload. Whether you’re new to dream interpretation or want to enhance your practice, Dream School offers everything you want. This opportunity is truly unique. Dream interpretation is a lost art, and the science is largely unknown or ignored these days. Even most therapists don’t know how to interpret dreams! Imagine that. Well, I know how to interpret dreams. I’ve proven it. And I know how to teach you how to do it. The $89 price for the dream interpretation course will increase to $129 after the introductory period is over. That way, I can devote more time to my students (that’s my dream!). 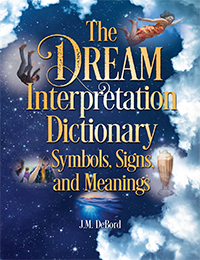 Also, as part of the course, you receive a copy of my book The Dream Interpretation Dictionary, a #1 Best Seller at Amazon. All together you get a college semester worth of material. But your journey lasts a lifetime. You can take it at your own pace. With online learning you can access Dream School whenever you want. What an amazing journey. Five years ago I published my first book about dream work, Dreams 1-2-3, and now I’m opening my own school of dream interpretation. People are rediscovering dreams as avenues for life enhancement and self-exploration, and I’m positioned to teach them how it’s done. I offer a way of interpreting dreams that’s based on tradition and science and my many years of teaching the subject. I boil it all down into a three-step system of dream interpretation, DREAMS 1-2-3. It’s simple yet thorough, and once mastered it will guide you to the meaning of the majority of your dreams. Anyone can understand their dreams and benefit from them. You just need to know how to do it. Go check it out. Watch the intro video and preview the lessons. What I offer at Dream School is unlike anything else online. Yes, I want to take online courses in dream interpretation and learn from the best. Take me there! Hi Dr. Frasier! My mom just had a dream about my brother who passed away, 2 years ago. She has taking out the trash and my brother was helping her throwing to the garbage truck. After clearing the trash, the brother sat by the passenger seat and my mom sat behind or by the hopper of the truck. We were wondering if there was a meaning regarding her dream. Thank you! I love when readers refer to me as Dr. Frazier. It tells me that you are paying attention — and perhaps that you watch Frasier. The show refers sometimes to dreams and those episodes have a lot of fun with the subject. Look at the action of your mom taking out the trash. That can mean, simply, “removing something that’s no longer useful.” If you connect that detail with the fact that your brother is in the dream, and that a big reason why we dream is to consolidate memories, it suggests that your mom is clearing away something related to his passing. For example, my mother in law passed away a year ago and for my wife it’s been nothing but pain and loss. But lately I’ve noticed a shift in her as she clears out those emotions. Slowly, she’s able to remember her mom without as much pain. With that in mind, view how the dream shows your brother helping her throw away the trash. It could be a way of saying “it’s OK to allow this process to happen.” Sometimes we hold onto grief instead of letting it go. Also, notice that at the end of the dream, the scene is painted in a way that implies readiness to move forward. That suggests the idea that once your mom clears away whatever is symbolized as taking out the trash, she’s ready to move forward personally, emotionally, spiritually.